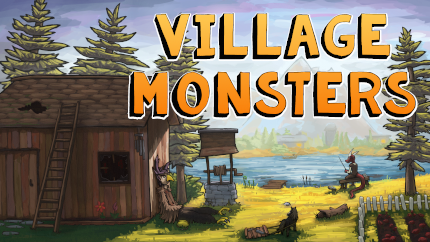 Village Monsters - A Monstrous Life Sim Game! 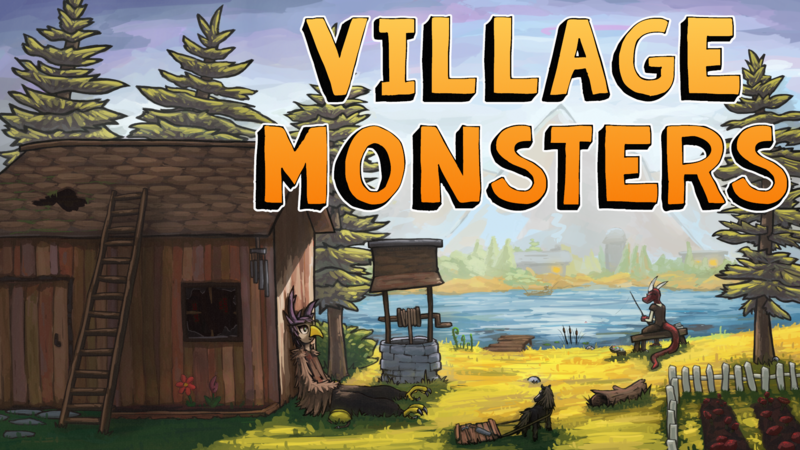 TIGSource Forums Community DevLogs Village Monsters - A Monstrous Life Sim Game! Re: Village Monsters - A cozy life-sim with adventure, mystery, and monsters! Your game's come a really long way for how short of a time you've been working on it so far man, great job. Omigosh YES! Let's just say #monsterlove and #respect! Good luck with it, and I wanna see some more of the monsters! Looks like you have a nice variety so far (not just typical skeletons and dragons) - I like that! Especially the potted plant one with big red arms. Looks really cool! I really like the concept for this game - the idea of people finding peace in an abandoned game really appeals to me for some reason . Out of curiousity - what features set Village Monsters apart from Animal Crossing? I had a look through the feature list, and apart from the story & art style, I'm not seeing many differences. Not saying that's necessarily a bad thing (I love AC games), just curious if you're trying anything new . I've always loved Animal Crossing. 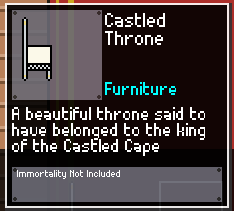 Throw in an "Earthbound-like" art style, and you just won me over completely. I'm also curious; what features might differ from Animal Crossing? What do you think is strictly unique to Village Monsters? EDIT: P.S. - I forgot to mention that I love the acoustic guitar-based music in the trailer. It suits the game's ambiance quite well! Did you make the music as well?! 2. Village Monsters is very 'systems' focused. Paired with the conceit of being set in an abandoned video game, this means I can give players sandbox-like features to play with. If it's raining and you find a way to make it colder - it'll snow. Trying to catch a rare fish during a thunderstorm? Make it easier by slowing down time. 3. Finally, and to be blunt, it'll have features that AC should have had years ago. You'll be able to have pets. You can spend time outside the village with villager friends, including special 'road trip' events. Collections you complete will give you special bonuses. House upgrades don't just increase floor space but also include things like a fenced yard and secret rooms. Sounds like a well thought out answer to me! I'll definitely be following this one as it develops . Feel free to hit me up if you need playtesters! I love when games take a twisted perspective in their design (ie: tell things from a villains perspective) design. Hope this gets the attention it deserves. Actually, I think you can take this concept even further: this could be a fun take on a common criticism of traditional gaming systems, namely that in many situations the game mechanics force you to apply violent solutions. In a first person shooter, the only solution is to kill everyone (or in some cases stealth around it). So the idea of an entire game world rejecting the originally intended gameplay and figuring out a different creative use for all kinds of game mechanics is like trying to find non-violent escape routes out of endless cycles of violence. Except, you know, not as heavy-handed as that sentence makes it look like. Or maybe this was the whole idea you were going for to begin with? Either way, looking forward to where you'll take this! The original design of the game featured this type of thing more heavily, but I could never get it working right. Probably my own weakness as a designer. There's definitely going to be a lot of repurposed elements from the 'original RPG' the game is based on, but it's mostly going to be in UI design and the village overall. There's also going to be some secret stuff that I'm keeping under wraps for now. Lovely concept! Been in the mood lately for AC-like games, and this seems like a really interesting take on it. Will be checking the demo out! It's the weekend, so that means I get to share everything I worked on last week in yet another edition of the Developer Diary Digest! Before I begin, I wanted to quickly plug something. You might not know this, but I have a newsletter for Village Monsters, and I would absolutely love it if you signed up for it! I try to reserve the newsletter for only big ticket items, so you'll be the first to know of releases and other important news. Anyway, back to the update! I had a few really productive weeks this month, so I guess I was 'due' to have a slow one. I didn't get nearly as much done as I had hoped, and I ended up getting caught in a few technical quagmires; still, I have things to share, so let's get on with it! Critter Capturing was the first hobby I put in, followed by Fishing and Archaeology. I had a bunch of ideas for other hobbies to add to the mix, but I wasn't sure which ones would work best. Well, until now. Village Monsters will now contain five hobbies for you to enjoy: Cooking, Critter Capturing, Botany, Fishing, and Archaeology. This post details some new updates to two of them. Botany is one of the new hobbies I've been working on, and it includes everything plant related. Like all prototypes it's a big work-in-progress. However, thanks to feedback from a user at another site I've had some intriguing ideas that I'm keeping under my hat. Stay tuned next week, yeah? Fishing was one of the first hobbies I implemented, but I haven't touched it since. It's in a sorry state as of the last demo, and I'm pretty embarrassed by how bad it is. What began as a 'revamp' quickly turned into a 'refactor' which the became a total 'rewrite'. I tossed out all my old code and rewrote it from the ground up. It was a slow process, but fishing is in a much better state in terms of stability and mechanics. Work will continue on this system this week as well. 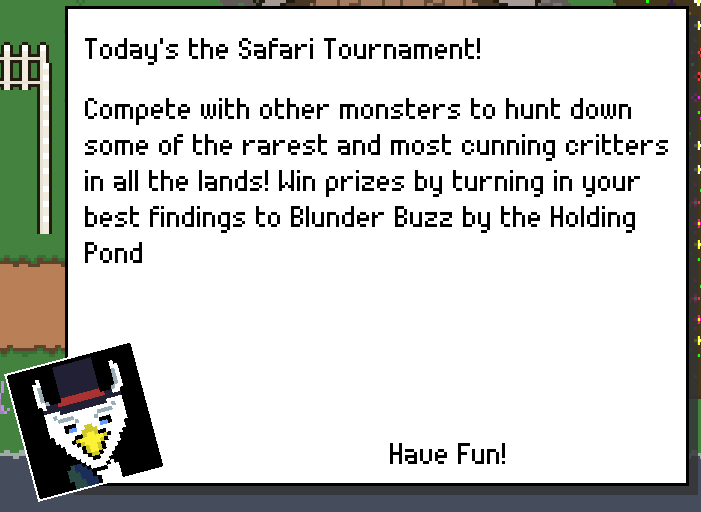 I've always been dissatisfied with fishing minigames in other life-sim games, so I'm going in a different direction. You can expect a system that's much more inspired by JRPGs than any existing life-sim out there. 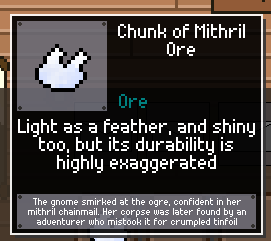 To wrap up, I also included a grab bag of bug fixes and quality of life improvements that I received from demo feedback. I also got a lot of writing in this week as well. 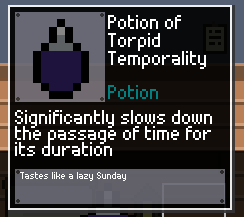 Every item - every single item - has a unique description and flavor text. Some even have detailed backstories. Pretty nuts, right? Well it's been a ton of fun, so there's no stopping me now. I just read the feature your game got on Rock, Paper, Shotgun and I just wanted to come by to say your game looks absolutely charming! I might not find the time to play it right away but I'll certainly be subscribing to this thread because your devlog is <i>also</i> charming! 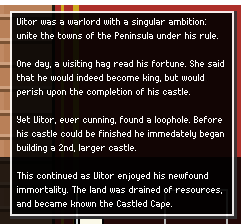 I dont have much of a history playing games in this genre, but the idea of it all being set within a long abandoned rpg is pretty interesting. That feeling of coming back to your old save for a game that you haven't played in years is a weird one, and the idea that the npcs have got tired of waiting and moved on with their lives is really appealing. I'll look forward to seeing the game develop, it looks great so far.